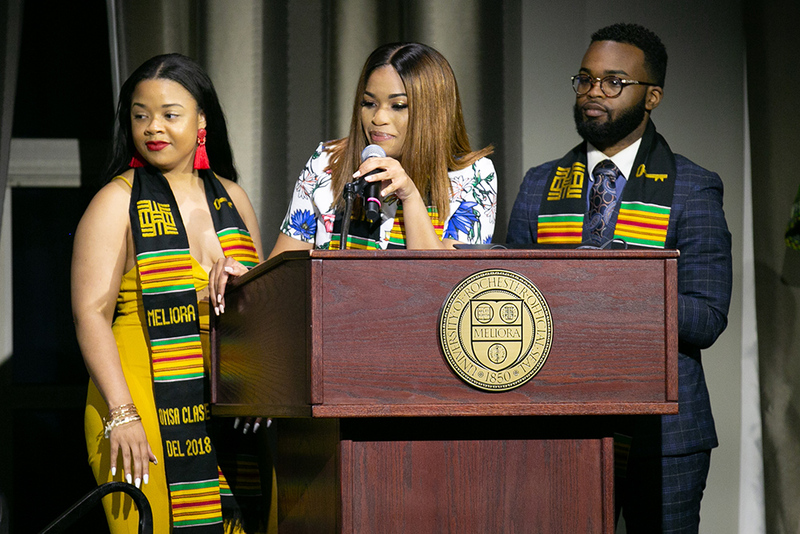 The Office of Minority Student Affairs (OMSA) recently honored 172 graduating students at its 45th annual senior dinner. 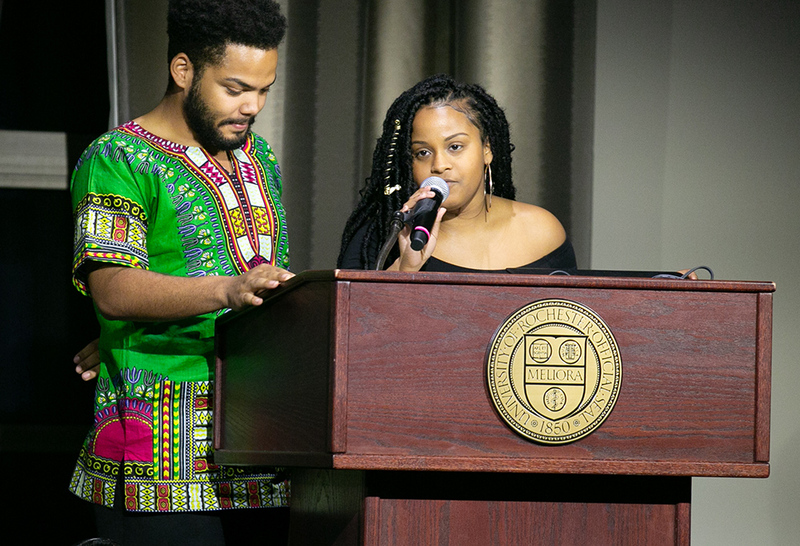 The celebration highlights OMSA’s role as an anchor for many undergraduate students of color during their time at Rochester. The office is the University’s official academic home of historically underrepresented minority students and connects interested students to various resources, on and off campus. “OMSA is not a home away from home; it is our home,” says Amber Hudson ’18, who graduated with a degree in English. Forty-five students started in OMSA before they began taking classes at Rochester. They were part of the Early Connection Opportunity (ECO) summer initiation program as rising first-year students, and five were awarded Brady Scholarships before the start of their first year. The scholarship was created in 2011 by recently elected trustee Elizabeth Pungello Bruno ’89, whose daughter, Hope Pungello, graduated from the University in May. 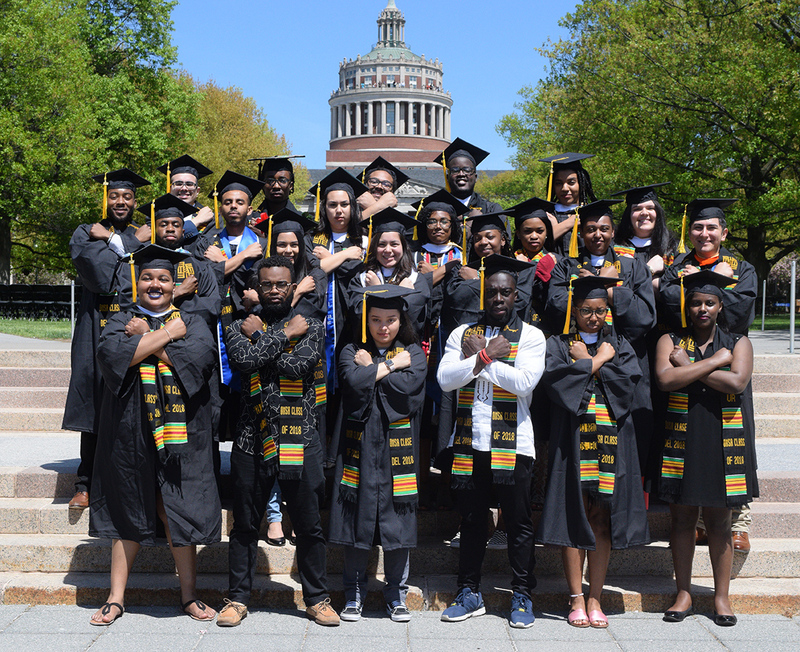 Twenty-two graduating OMSA students were HEOP Scholars, first generation students from New York State who are near the top of their high school class and are admitted to the University based on financial and academic requirements. Nine were part of the first Posse Foundation cohort. The foundation was founded in 1989 to identify high school students with extraordinary academic potential who may be overlooked by the traditional college selection process. 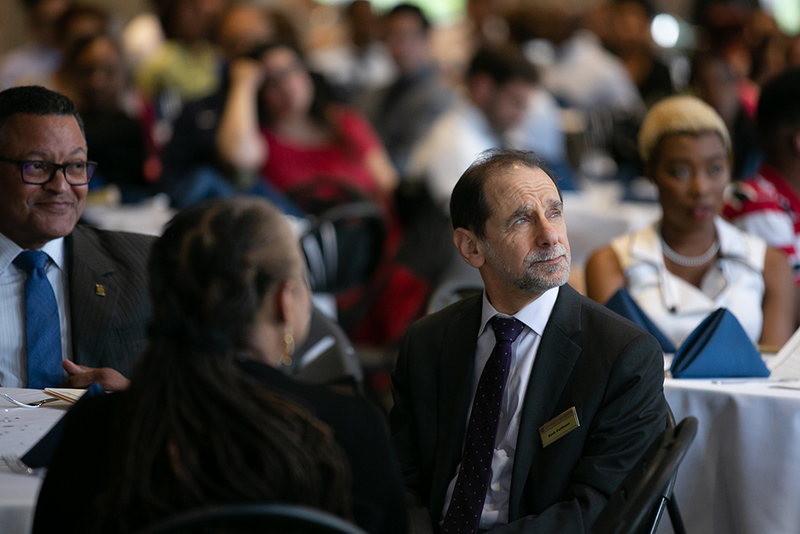 More than 400 guests attended the dinner at Feldman Ballroom in Douglass Commons, including University president Richard Feldman, dean of the College Jeffrey Runner, and Kenneth Morris, Jr., who received the honorary Doctor of Laws degree at commencement in honor of his great-great-great grandfather, Frederick Douglass. 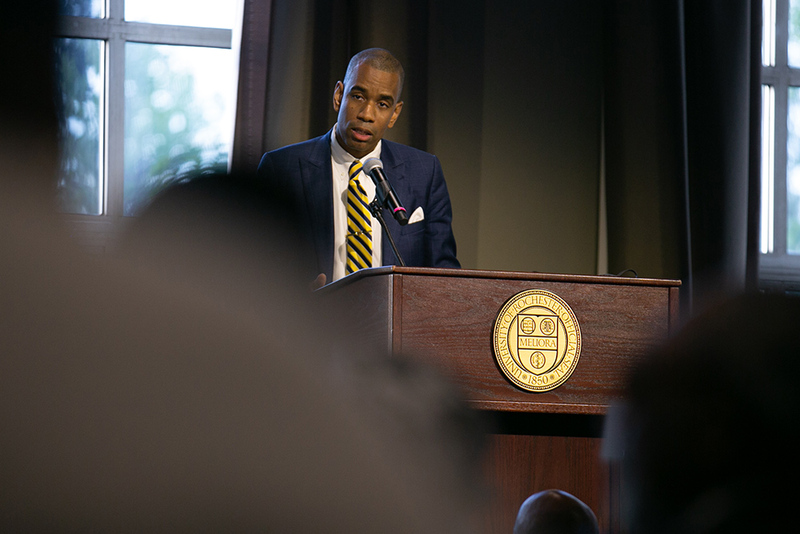 Malik Evans ’02, a member of the City of Rochester Council, was the keynote speaker. The next ECO program runs July 8 through August 4, when another group of first-year students will arrive on campus. 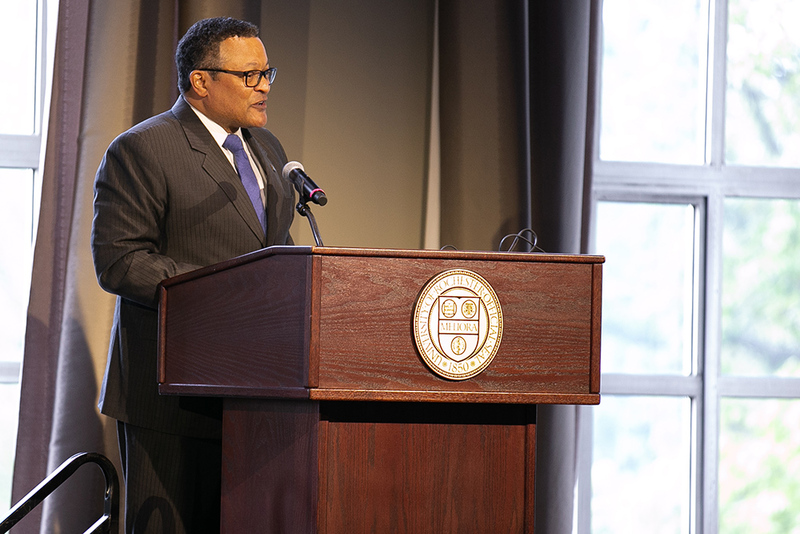 “In keeping with tradition, I’m confident the incoming HEOP and ECO scholars will contribute immensely to the academic and co-curricula life of the campus,” says Norman Burnett, assistant dean and OMSA director. 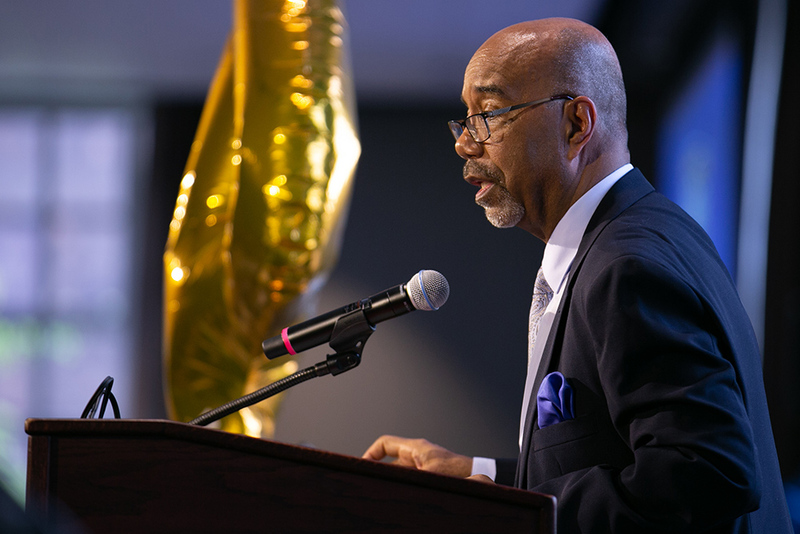 Norman Burnett, assistant dean and director of the Office of Minority Student Affairs (OMSA) greets graduating students and their friends and families at the 45th annual Senior Dinner. President Richard Feldman, left, alongside special guest Kenneth Morris Jr.
Kenneth Morris Jr., the great-great-great grandson of Frederick Douglass, offers words of encouragement to the graduating OMSA seniors. 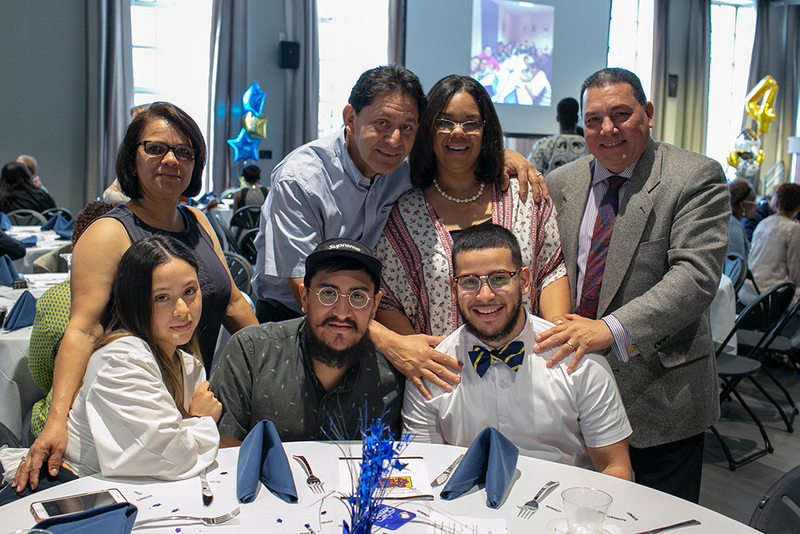 Josue Hernandez ’18, right, pauses for a family photo while enjoying the OMSA Senior Dinner. 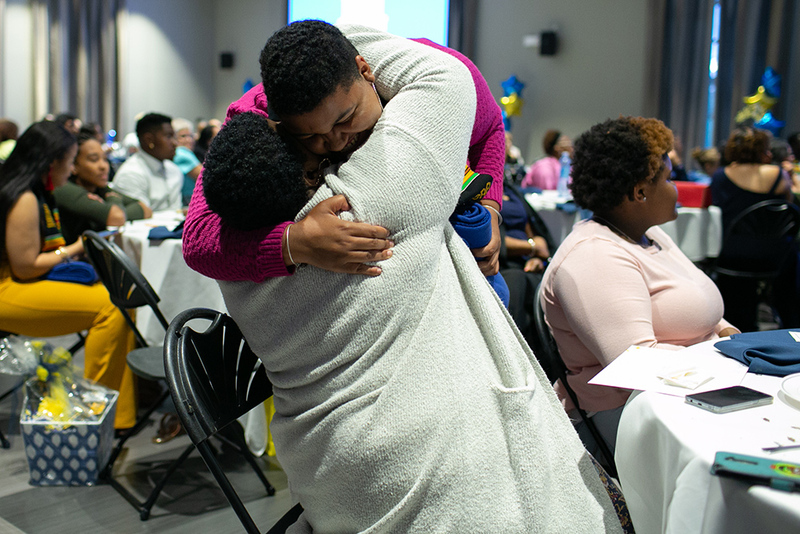 Shelly Ann Hudson, right, hugs her daughter Amber Hudson ’18 as she’s announced as the recipient of the 2018 Family Pillar Award. Malik Evans ’02 delivers the Senior Dinner keynote address. 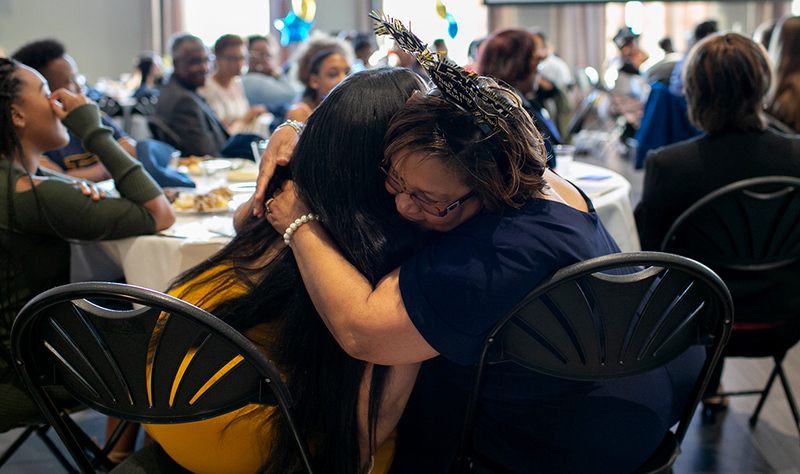 Samekh Harris Reed ’18 receives a hug from her mother along with her OMSA senior gifts. 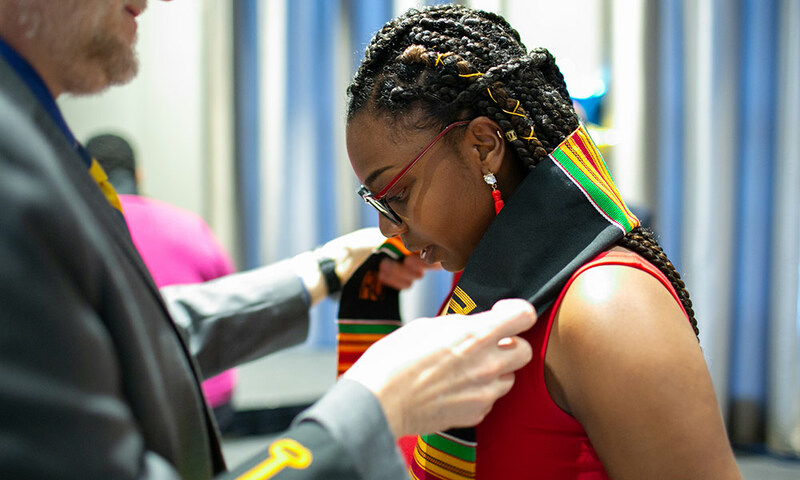 Frankie Romero ’18 receives her kente stoll. 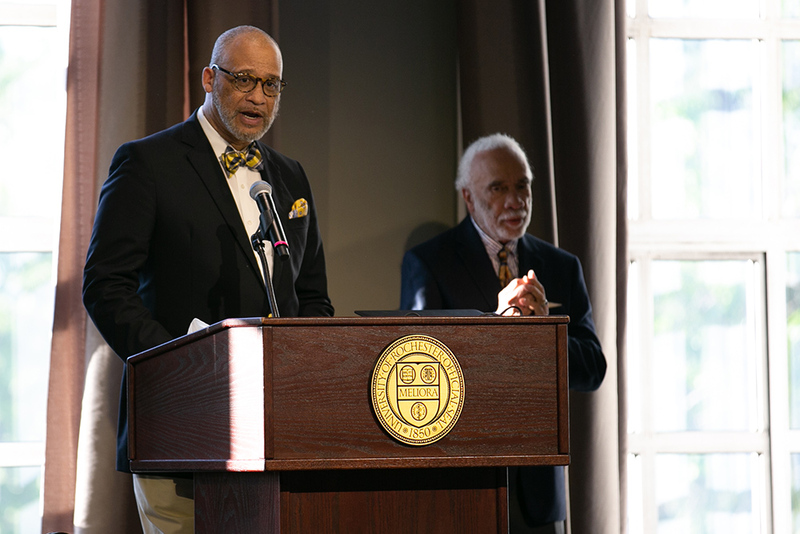 As Frederick Jefferson looks on, Thomas Crews, left, assistant director of Higher Education Opportunity Program and senior OMSA advisor, presents the Frederick Jefferson Award. From left, Amber Hudson ’18, Caryl English ’18, and Delvin Moody ’18 deliver the senior charge to their fellow students. Justin Delinois ’19 and Tara Eagan ’19 deliver the junior response. « Alien apocalypse: Can any civilization make it through climate change?